For anyone who may be interested, I’ve attached photos of portraits of Charles E. Dayton and his wife Nancy Goodnow Dayton. These period portraits are in my possession, handed down through my father. They appear to be charcoal-enhanced, possibly from photo projections created sometime in the late 1870’s to 1880’s. It is assumed that both portraits existed during the lifetimes of Charles and Nancy although it is possible, judging from appearance and style, they were produced after their passing, in accordance with common Victorian custom. Charles was the son of Henry Dayton Apr 18, 1792-Sept 26, 1849 and Christie Ann Cameron Dayton Jan 18, 1796-Oct 4, 1865. The graves of Henry and Christie were located near the SW corner of their Hadley Hill NY farm property, but their remains were moved to Dean Cemetery on the Stony Creek Road in 2005, where they rest next to Charles and Nancy. 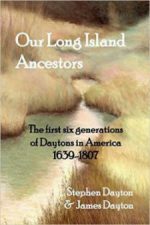 Henry Dayton was the son of David Dayton Junior (our last ancestor from Long Island) and Chloe Skiff. Henry had siblings Joel, Chloe, Eunice, Telem, Irinda, Anna, Orrin, Orange, Erastus and Louisa. Charles Erastus Dayton May 29, 1832-Sept 26, 1882 and Nancy Goodnow Dayton Jan 19, 1838-Mar 17, 1883, were born in Hadley NY and lived their entire lives there, running the family farm that had belonged to his father Henry. Both died there. A tintype below, judged to be from the 1860’s, is held at the Stony Creek Historical Society. The couple had five children: Delbert Henry Dayton of Iowa, James Warren Dayton of Greenwich NY, Jennie Finette Dayton Roach of Greenwich NY, Wilbur Thomas Dayton of Corinth NY, Carrie Belle Dayton Harris of Gloversville NY. This entry was posted in David Dayton, David Dayton Junior, Hadley NY, Henry Dayton, Uncategorized and tagged Carrie Harris, Charles Dayton, Christie Ann Dayton, Dean Cemetery, Delbert Dayton, James Warren Dayton, Jennie Roach, Nancy Goodnow Dayton, Wilber Dayton, Wilbur Dayton. Bookmark the permalink.